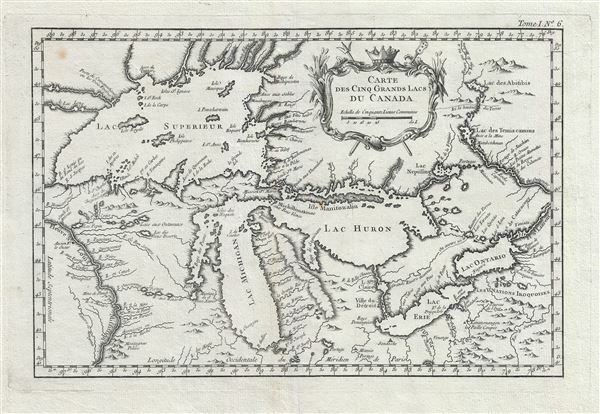 The earliest map to use the term Great Lakes. Includes four fictional islands in Lake Superior later used to draw the post-Revolutionary War US-Canada border. Carte des Cinq Grands Lacs du Canada. An unusual 1764 variant edition Jacques-Nicholas Bellin influential map of the Great Lakes. This is the earliest known map to use the term 'Great Lakes'. Cartographically, this map follows Bellin's 1744 mapping of the Great Lakes. That map, preceded only by a 1742 proof noted by Kershaw, is the first to depict the four fictive islands in Lake Superior (Philippeux, Pontchartrain, Maurepas, and St. Anne) - islands that nonetheless significantly influenced the structuring of post-Revolutionary War borders between British Canada and the fledgling United States. It is also notable for being among the earliest maps to identify Detroit and the Port of Chicago. Bellin's map covers all five Great Lakes and their adjacent drainage systems in considerable detail, noting known fortifications, American Indian villages, missions, and some speculative topography (particularly in Michigan). It was Charlevoix who invented the four spurious islands in Lake Superior, here noted as Philippeaux, Pontchartrain, Maurepas, and St. Anne. The islands were intended to honor Charlevoix's personal patron, the Count of Maurepas, Jean-Frederic Phelypeaux. The largest of the three islands, Philippeaux, is named directly after the count. The second largest island, Pontchartrain, refers to Phelypeaux's family estate. The third island, which may in fact be a mismapping of the factual State Islands, is named after the count's seat, Maurepas. The fourth and smallest of the islands, St. Anne, references the count's patron saint. Charlevoix described the islands as being rich in minerals leading numerous explorers to search for them in vain. Bellin dutifully introduced the four islands to his map, offered here, and such was his influence that they were subsequently copied by most subsequent cartographers, including John Mitchell in his seminal 1755 wall map of North America. The highly regarded Mitchell map was used in negotiating the 1783 Treaty of Paris that formally concluded the American Revolutionary War. Therein, the apocryphal Philippeaux was assigned as a marker for the new United States - British America border thus setting the stage, as one might image, for later political strife. This map went through several editions, most of which saw only minor cartographic updates, but often were presented in different sizes or with different titles. The present example, issued for Bellin's 1764Petit Atlas Maritime, is the first and only state of Bellin's iconic map to use the term 'Great Lakes' or in this case 'Grands Lacs'. Very good. A exceptional impression. Slight wear on original fold lines. Wide margins. Thick stock. Platemark.